Anya has never been one for the spotlight, but her family seems to now be front and center, and the talk of the town in Underlayes. In the aftermath of her mother’s death, the discovery of said mother’s deceit, and Anya’s half-sister getting ready to challenge her own father for the witches’ throne, keeping a low profile may prove to be difficult. Add in the fact that she’s pregnant, by her female mate, and it may turn out to be impossible. Kierra has never been one for many words. So if she were forced to explain how she impregnated Anya, it probably wouldn’t be easy for her. Especially since the truth would mean revealing her origins; she’s not a vampire, or even anything close to it. And living in a realm where her kind isn’t allowed may cause a few ramifications. Plus, should the kid call her Mom, or Dad? Jump right back into the world of Underlayes where this magical family takes dysfunction to brand new heights. Magnus Blackwell’s past is about to catch up with him. An evil force has seized New Orleans. Pestilence, suffering, and darkness cloak the city. The citizens are scared and need their mambo to guide them, but Lexie Arden can’t help anyone. A diabolical presence has taken Lexie’s power and severed her ties with the other side. Magnus Blackwell is fighting demons of his own. Torn between his devotion to Lexie and a spirit from his past, Magnus’s loyalty is put to the test. He must revisit his sins to uncover the key to the hatred ripping the city apart. If he doesn’t, Lexie’s reign as mambo will end. Their search for answers leads them deep into the darker realms of voodoo—until a desperate Lexie does the unthinkable, and Magnus can do nothing to spare her from her fate. Over a hundred years after the death of Magnus Blackwell, Altmover Manor sits abandoned. Lexie Arden and her fiancé, Will Bennet, are determined to rescue the neglected Mount Desert Island landmark. They want to make Altmover Manor their home. But Magnus has other plans. A spirit bound to his former residence, Magnus finds himself inexplicably drawn to the young woman. She has a supernatural gift; a gift Magnus wants to exploit. As Lexie and Will settle in, secrets from Magnus’s past begin to surface. Compelled to learn all she can about the former owner, Lexie becomes immersed in a world of voodoo, curses, and the whereabouts of a mysterious dragon cane. Magnus’s crimes won’t be so easily forgotten, and what Lexie unearths is going to change the future … for everyone. 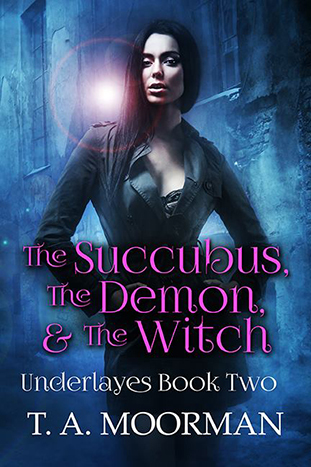 I’m back in the Underlayes, this time reviewing book 2, The Succubus, The Demon, & the Witch. Feel free to skip past the book information to get to the review. Or maybe you want to get to T.A. Moorman’s guest post about how much her own life has made it into her books. There’s also a giveaway in there, so don’t skip around too much. And make sure you check out the release day party on Facebook today starting at noon. 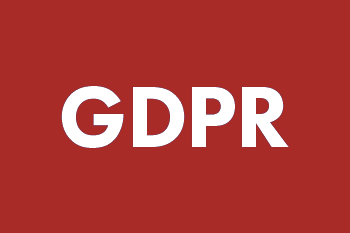 As I’ve gotten further into the world of Book Blogging, I’ve found lots of different books that sound interesting with an opportunity to review. Avid little reader that I am, I’ve jumped on several. 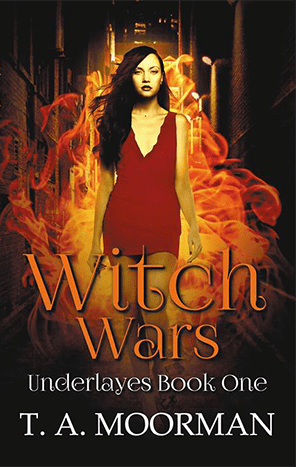 In this case, I was only expecting to receive an ARC of book 2, The Succubus, the Demon, and the Witch as part of a release day book blitz, but was pleasantly surprised to receive book 1, Witch Wars as well. Keep an eye out for my review of book 2 on March 27th. Feel free to skip past the book information to get to the review.